In a little shop near the Louvre museum in Paris, a very strange type of ice cream is being sold. At the counter customers don’t order cups, cones or shakes; here they ask for WikiPearls, little donut hole-sized balls of ice cream that are covered in a flavored, protective skin. “People come in and say, ‘What’s this all about?’” says David Edwards, the mastermind behind WikiPearl and the newly opened WikiBar. It’s a very good question, actually. Much like Dippin’ Dots, the pearl-like ice cream that blew kids’ minds in the ‘90s, WikiPearls is angling to change the way we eat ice cream. But it’s not just frozen snacks that Edwards is looking to revolutionize—the Harvard bioengineering professor has bigger plans than that. Back in 2009 Edwards and French designer Francois Azambourg began developing a new technology to eliminate packaging from foods. 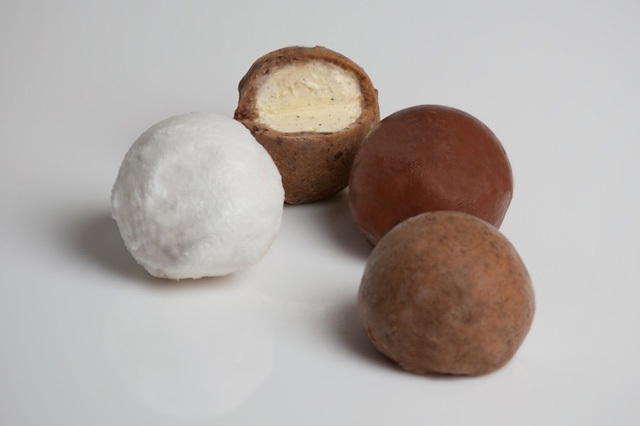 Called WikiCells, the edible soft skins are made from natural food particles that are bound together by nutritive ions. The goal was to reduce plastic waste while improving human health through portion control and vitamin-supplemented skins. WikiPearl is the first commercialized product born from the technology, mainly because ice cream is delicious, and it’s the least weird form his WikiCells could possibly take. “Some products are a more radical departure from what people are used to than others,” he says. “But ice cream and frozen yogurt in the WikiPearl form is really easily understood. 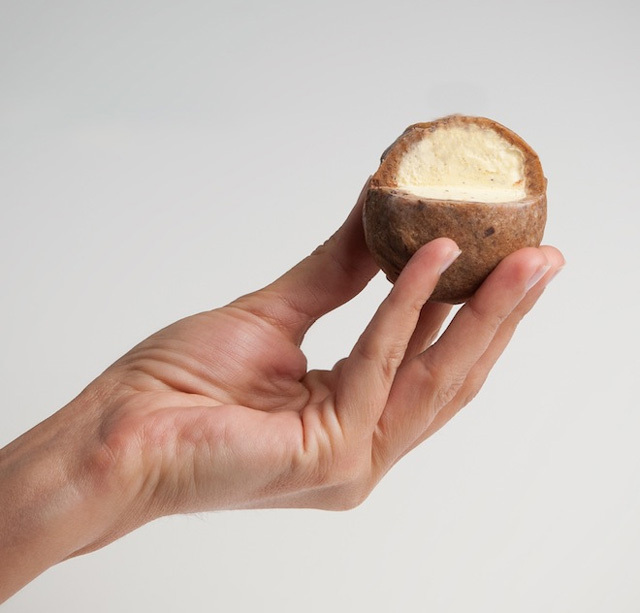 It’s sort of very intuitive.” Three 50-calorie balls roughly equals a cup of Häagen-Dazs ice cream, and so far they come in three flavors: mango with a coconut skin, chocolate with a hazelnut skin and vanilla with a peanut skin. An added bonus: they melt a helluva lot slower than regular ice cream. Put a few balls inside a specially-designed cooler that’s sold at WikiBar and Edwards says they can last up to eight hours (good news for those of us who’ve been trying to bring ice cream for lunch). The WikiBar, a modern-day Willy Wonka space designed by Mathieu Lehanneur, is more or less an experimental laboratory disguised as a retail ice cream shop where Edwards can test his theories about how we might eat in the future. “We view what happens in the WikiBar very much as collaboration with the public where we’re sort of trying new things out,” he explains. This follows the form of Edwards’ other venture Le Laboratoire, a community innovation lab where he gets feedback on the technology he and his partners develop. “It’s hard to be inventing for 2025 and not have any dialogue with the public,” he says. Edwards views the brick and mortar WikiBar as a way to not only introduce the WikiPearl concept to the public, but also to ready the product for its commercial launch this fall in the United States and prepare for another WikiBar opening in Cambridge, Mass., next year. Of course, technology is nothing without adoption. And the fact is, when you’re used to drinking a soda from a can or eating yogurt from a plastic cup, it’s weird to pop a little food ball in your mouth and call it a meal. Edwards acknowledges that the adoption curve is going to take some time, but he figures starting with ice cream, yogurt and cheese should lessen the strangeness of wiki-eating. Written by Liz Stinson. Originally appeared on WIRED.